I really shouuld spend more time looking for alley cats—those that wander along the parallel throughways behind most buildings in the neighborhood. Had I, Choontzy, who also goes by Chootzy, surely would have joined the series sooner than this breezy Monday. He is the first invited cat, so to speak. Last week, on the NextDoor social network, someone posted inquiring about friendly Snowshoe Willow, whose December 2017 profile I linked to in the replies. Among the responses, Choontzy’s caretaker expressed appreciation for the series and desire for him to join it. 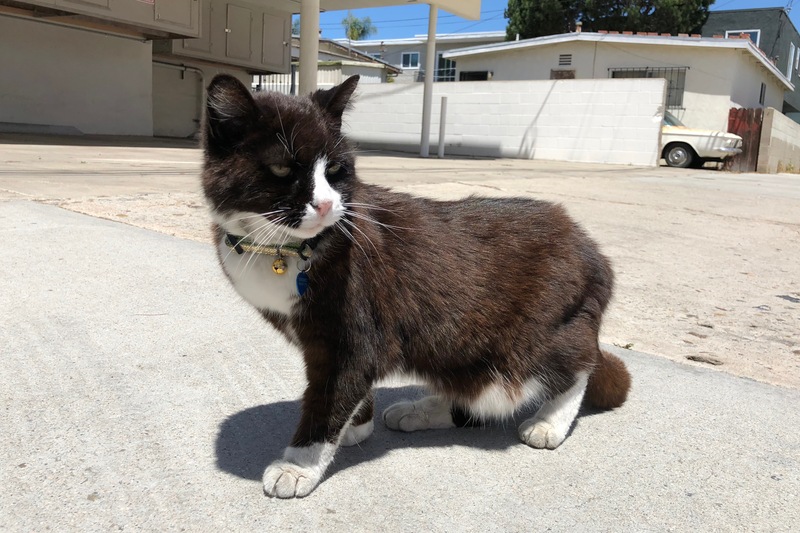 So, of course, I went on the hunt for the elder tuxedo—eighteen years old, like Gracie and Precious. “He’s been with me since fall of 2014”, Chootzy’s owner explains. “His people asked me if I would take him in, and I couldn’t refuse. He’s out a lot and it’s hard to keep him inside. That’s how he was when he met me. Luckily, I work from home so I can keep an eye on him”. An older outdoor cat could easily be more attached to his territory than to his owners. Leaving him behind in familiar surroundings, with a good caretaker, was the right decision to make (or so I say). 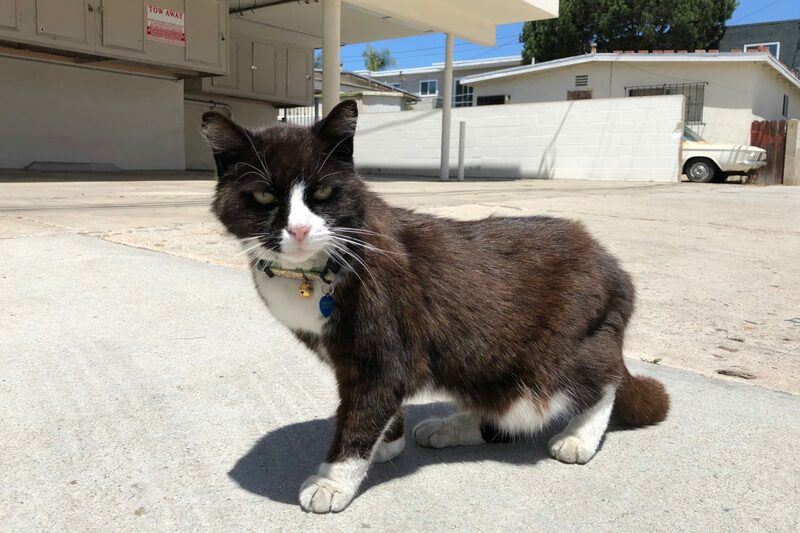 I ventured down the alley four times over two days looking for the well-attired shorthair. Yesterday “he spent the day on the patio”. How unfortunate. 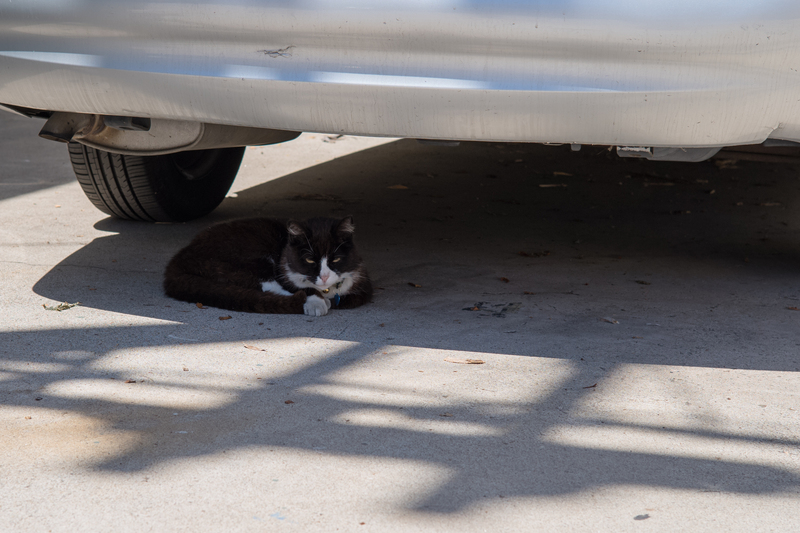 But this morning, as my wife and I walked by, Anne spotted him resting in the shade of a car. I crouched down with Leica M10 and Summarit-M 1:2.4/50 lens and snapped the Featured Image. Clearly somebody is sleepy. Vitals: f/8, ISO 100, 1/350 sec, 50mm; 11:44 a.m. PDT. I lay down on the ground with iPhone X for the two close portraits. These are the best that don’t glaringly reveal the owner’s phone number. Vitals for both: f/1.8, ISO 20, 1/2525 sec, 4mm; 11:49 a.m.
Choontzy is a darling, and his fur is surprisingly soft and well-kept for a kitty of advanced age (grooming habits tend to be poorly among elder putty-tats). Anne and I enjoyed the visit, as we hope that he did, too. And we look forward to a greet-and-meet when the sun isn’t so stifling for furballs. He’s so special, he has his own Facebook page. Previously featured felines: Scruffy, Roly Poly, Woo, Skull, Biscuit, The Colonel, White, Chipper, Frisky, Stretch, Needy, Farfisa, Mates, Hunter, Pee-Pee, Blue, Blue Too, Bonded Pair, Patience, Fess, Jumper, Frenemy, Looker, Cozy, Scout, Lurks, Skit, Mini, Betty, Black and White, Stalker, Bell, Chill, Sammy, Scratch, Poser, Star, Grey and White, Watcher, Herman, Comet, Roman, Willow, Chub, Nimbus, Watson, Lilo, Kit, Pepe, Twilight, Sebastian, Spot, Booger, Ash, Veruca, Riley, Mellow, Bonde, Flower, Glass, Black, BeBe, Fang, Bruce, Siamese, Pounce, Tortie, Haiku, Fraidy, Peso, Daniel Tiger, Dusk, Stride, Dainty, Spry,Tabby, Betty Too, Still, Levi, Shadow, Sophie, Wink, Ferals, Momma, Charlie, Tux, Cool, Benny, Jellicle, Itchy Valentino, Goldie, Nine, Amanda, Siesta, ChaCho, Charlie, Too, Mika, Crystal, Seeker, Mittens, Dancer, Smokey, Monkey, Captain Blackbeard, Season, Maven, Tink, Chunk, Curious, Hanoi, Bella, Tarry, Guido, Maxine, Mr. Kitty, Peohe, Panda, Frankie, Sunshine, Twain, Willow, Too, Brawn, Reddy, Burglar, Laramie, Lupe, Bright, Tom, Charm, Buddies, Boss, Ohana, Seer, Fresh, Token, Lola, Carl, Bramble, Finny, Cal, Tipsy, Zander, Mew, Penny, Charlie (the Third), Bob, Apple, Persepolis, Sebastian, Too, Holiday, Snow, Desire, Luci, Torbie, E.T., Bushy, Cali, Precious, Gracie, STAR, Sky, Amble, Aylin, Lucky, Herbie, The Love Bug, Roadie, Harley, Wonder, Dizzy, Moophie, and Lucy.